The German Shorthaired Pointer was developed by German hunters to be an all-round hunting dog and companion. The development of this breed paralleled the evolution of firearms and the social changes which permitted middle class hunters to lease hunting preserves. While the English developed highly specialized dogs for each type of prey, the practical German hunter wanted a single dog who could scent the wind for birds and trail furred game on the ground; who was fierce with predators yet friendly with the family. The foundation stock for this breed was probably a German descendant of the Old Spanish Pointer. Local scenthounds were crossed because of their powerful tracking ability and their dependability in water. English Pointers were added to the mix for their elegant hunting style. The first German Shorthaired Pointer was entered in the German stud book in 1872, but they did not come to the attention of American hunters until the late 1920s. Since then, the German Shorthaired Pointer has become a popular gun dog and companion. The German Shorthaired Pointer was recognized by the United Kennel Club in 1948. The German Shorthaired Pointer is a balanced dog of noble appearance, the conformation of which ensures strength, endurance and speed. Proud attitude, smooth outline, short, shiny coat and well-reaching, harmonious strides emphasize its nobility. The German Shorthaired Pointer should be evaluated as a working gun dog, and exaggerations or faults should be penalized in proportion to how much they interfere with the dog’s ability to work. The key word to describe the German Shorthaired Pointer is versatility. They are willing, enthusiastic workers who thrive in the most rugged country and weather. They retrieve equally well on land and water and can locate dead or wounded game in the heaviest cover. As a companion, the German Shorthaired Pointer is friendly, intelligent, and eager to please. The head is proportionate to the size of the dog, clean-cut without exaggeration. When viewed from the side, the skull and muzzle are approximately equal in length and joined by a gradual stop that appears more abrupt than it is because of the moderately well-defined supraorbital arches over the eyes. The skull is moderately broad and slightly arched laterally and longitudinally. There is a slight median furrow between the eyes at the forehead, and the occipital bone is not conspicuous. Cheeks are clean with well-developed jaw muscles. In profile, the muzzle is long and deep, with sufficient power to seize and carry game. The bridge of the muzzle rises gradually from nose to stop. This rise is more strongly pronounced in males. Viewed from above, the muzzle is wide with very little taper from stop to nose. Lips are slightly pendent but not overly thick. The top lip should fall naturally over the lower without folds or drooping, so that the underline of the jaw is straight and roughly parallel to the bridge of the muzzle when viewed from the side. The nose projects somewhat over the mouth so that a line drawn from the tip of the nose to the end of the lower jaw slopes downward and backward. Faults: Concave or dished muzzle; snipey muzzle; heavily wrinkled forehead; lips too large or too small. The German Shorthaired Pointer has a complete set of evenly spaced, white teeth meeting in a scissors bite. Disqualifications: Undershot or overshot bite. Wry Mouth. The nose is large, with well-opened nostrils. It is solid brown in liver-colored dogs, and black in black-colored dogs. The eyes are set in to the skull, but not too deep, and wide apart. They are medium sized and almond-shaped. Eye color is brown. Darker brown is preferred. Eyelids are close-fitting. Eye rims are brown in liver-colored dogs, and black in black-colored dogs. Disqualifications: Functional abnormality of eyelids or eyelashes. The ears are pendent, broad, and rounded at the tips. They are set on just above eye level and are of medium thickness, hanging close to the head with no pronounced fold. When pulled forward, the ear should almost reach the corner of the mouth. When moving, some German Shorthaired Pointers will fold their ears, but when the dog is alert, the ears are as described above. Faults: Ears too long; ears too fleshy or too thin; ears to small and pointed; ears permanently folded. The neck is moderately long, slightly arched, and sufficiently muscular to carry a grown fox or goose for some distance. The circumference of the neck widens from the nape to where the neck blends smoothly into well laid back shoulders. The skin of the throat fits moderately close. The shoulders are smoothly muscled. The shoulder blades are long and well laid back, with the upper tips about two fingers breadth apart at the withers. The upper arm appears to be equal in length to the shoulder blade and joins it at an apparent right angle. The elbows are close to the body. The forelegs are straight, strong and sturdy in bone, but not heavy-boned. Pasterns are strong, short, slightly sloping, and with a slight spring. Viewed from the side, the forelegs are set under the withers. Faults: Toeing inward or outward; straight shoulders; short upper arm; knuckling over; down in the pasterns. 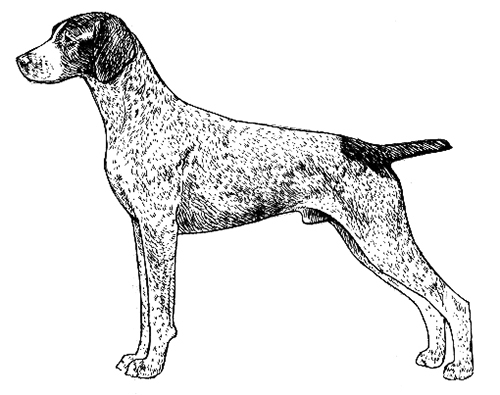 A properly proportioned German Shorthaired Pointer is slightly longer (measured from prosternum to point of buttocks) than tall (measured from the withers to the ground). The length of the front legs (measured from point of elbow to the ground) is slightly longer than the deepest part of the body. The ribs extend well back and are well sprung out from the spine, forming a broad, strong back, then curving down and inward to form a deep body, extending to the elbow. The circumference of the thorax immediately behind the elbows is smaller than that of the thorax about a hand’s breadth behind the elbows so that the upper arm has room for movement. The forechest extends only slightly in front of the point of shoulder. Should not have an excessively developed prosternum. Viewed from the front, the chest between the forelegs is well filled and is at least as wide as a man’s closed hand. The back is short, muscular, and slightly sloping from withers to set-on of tail. The loin is of moderate length, muscular, and slightly arched with moderate tuck-up. The croup is wide and slightly sloping. Faults: Back too long; roached back; swayback; chest too broad; chest too hollow. Serious Faults: Chest too narrow; pigeon chest. The hindquarters are moderately angulated, broad, strong, and well-muscled. In profile, the croup is long and slopes slightly. Exaggerated angulation limits endurance and should be penalized accordingly. The hocks are well let down. When the dog is standing, the strong rear pasterns are perpendicular to the ground and, viewed from the rear, parallel to one another. Faults: Cow hocks; spread hocks; sickle hocks; over-angulation; short, steep, or flat croup. Good feet are essential for a working gun dog. The dog should stand and move with its weight distributed over the whole pad. The feet are large, webbed, and round-to-spoon-shaped, with somewhat long, well-arched toes, and thick, hard pads. Dewclaws on forelegs may be removed. Faults: Splay or hare feet; feet pointing in or out. The tail is set high and is customarily docked to about halfway of its natural length. The tail is thick and muscular at the base and tapers toward the end. When the dog is relaxed, the tail hangs down naturally. When the dog is moving or alert, the tail is carried level with the back or only slightly above level, but no higher than 45 degrees above the horizontal. When quartering, the tail should wag laterally. The tail should never curve over the back or be carried between the legs. 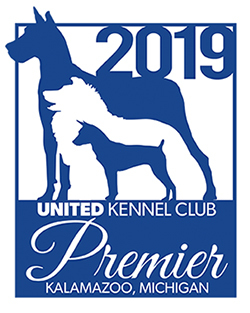 Note: UKC acknowledges that the practice of tail-docking is forbidden in some countries, and therefore feels that no dog shall be penalized for a full tail. A natural tail is acceptable. It should reach to the hocks, and should be carried straight or slightly saber-like. Serious Fault: Tail curved over the back. Short and dense, and feels rough and hard to the touch. The coat may be somewhat longer on the underside of the tail and the back edges of the haunches. Coat is softer, thinner, and shorter on the ears and head. The coat may be of solid liver or any combination of liver and white, including liver and white ticked, liver spotted and white ticked, or liver roan. The coat may be of solid black or any combination of black and white, including black and white ticked, black spotted and white ticked, or black roan. Disqualifications: Albinism. Any red, orange, or lemon color anywhere on the dog’s coat. Desirable height at maturity for males is from 24 to 26 inches; and for females, 23 to 25 inches. Deviation of one inch above or below the described heights is permissible but not desired. Desirable weight for a male in working condition is between 55 and 70 pounds; and between 45 and 60 pounds for a female. When trotting, the gait is effortless, smooth, powerful and well coordinated, showing good but not exaggerated reach in front and drive behind. The topline remains level with only a slight flexing to indicate suppleness. Viewed from any position, legs turn neither in nor out, nor do feet cross or interfere with each other. As speed increases, feet tend to converge toward center line of balance. It is recommended that dogs be shown on a loose lead and moved at a moderate speed to reflect true gait. Poor movement should be penalized to the degree to which it reduces the German Shorthaired Pointer’s ability to perform the tasks it was bred to do. Functional abnormality of eyelids or eyelashes. Any area of red, orange, or lemon color anywhere on the dog’s coat.